Age; Far too old. Or, ya know; Twenty-four. Location: My room, in The United States. January, two thousand and fourteen. I obviously don't post on here anymore. I'm fairly active on fanfiction.net under the same name. I still come here every once in a while to catch up on some things. Kinda sad I never got to post all of the things I wanted to on here, but it is what it is. I don't have the patience to fix tiny errors that no one would notice anyway. Music: If i\'m not home, I\'m probably at a show of some kind. Anything from Cody Simpson to Asking Alexandria. Simple Plan is my favorite band in the entire world. Yellowcard, I See Stars, Mayday Parade and Hanson round out the top five. TV: The Golden Girls is my all time favorite show. I have every season on DVD. Criminal Minds, Bones, Family Guy and South Park finish the top five. Movies: Harry Potter. Diary Of A Wimpy Kid. Children Of The Corn. That\'s really all I need. Books: Anything by Scott Westerfeld; I have everything he has out; I might be in love with him. Harry Potter. Bleed. Blue Is For Nightmares. The Clique. Gossip Girl. Twilight. I\'ll read just about anything. Naruto. Death Note. Bleach. Harry Potter. 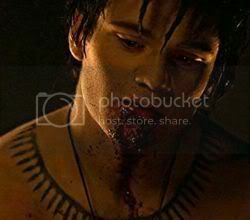 True Blood. Twilight. South Park. Criminal Minds. Bones. NCIS. If you write about one of those things, I\'ll probably read it.